I love analytics. Really. The numbers quite often confirm what we see on the field, and indeed they often explain why things are the way they are. You want to know when Bryce Harper took that next step and became an MVP in 2015? Take a look at what FanGraphs calls its “plate discipline” metrics and you’ll have a great foundation for understanding where it all went right. So why would I go totally non-analytic in making a pre-season prediction? In a word, tradition. That and the relationship between PECOTA and the Kansas City Royals. Long before we common fans knew about O-swing rates and exit velocities, we had our eyes and ears. We could see confidence and indecisiveness. We could hear “the sound” of a perfectly-struck ball or the whoosh of a good ‘ol country fastball. We could recognize a group of guys playing loose and having fun, versus grinding it out from the beginning. 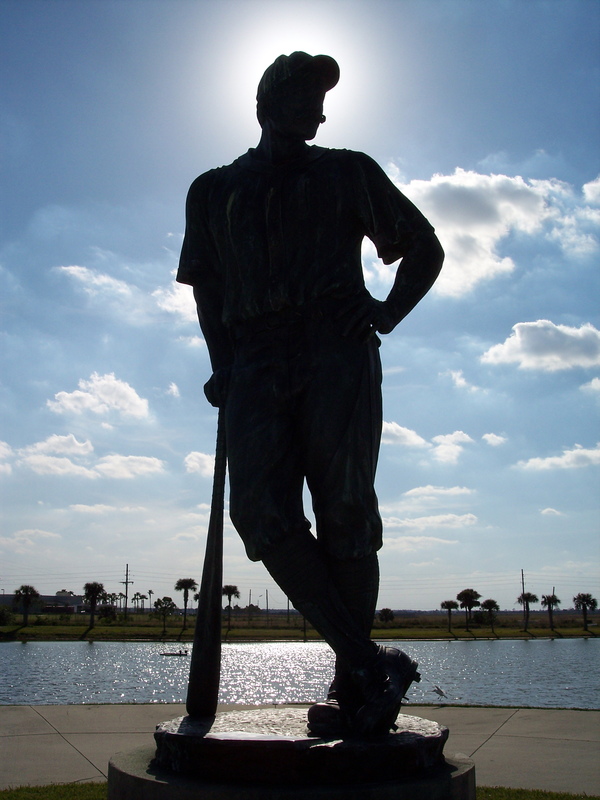 Until ten years ago, Spring observations were the only pre-season prediction tools for most of us. Even now, Spring is a time for getting out from behind the keyboard and into the sun for some totally subjective evaluation. So here it is: for me, the 2016 Nationals have the look and feel of a 100 win team. “Look and feel”? You betcha. Reason 1: Mental state. 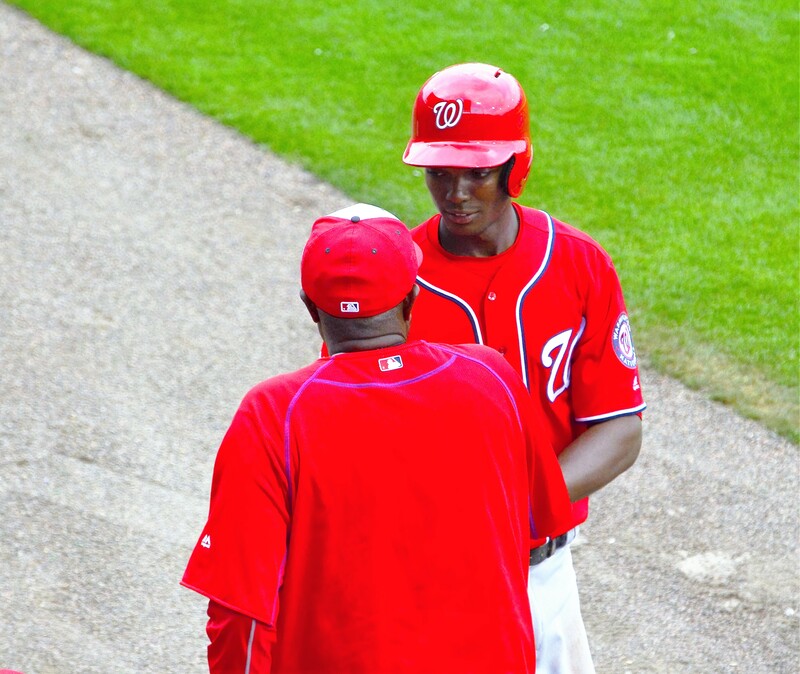 The 2012 Nats exceeded expectations, yet you could see it coming during the Spring. They were loose. They were eager. They were surprisingly confident, even brash, for a team that had been break-even in 2011. In 2013, we could see that the eagerness was gone, replaced by tension borne of expectations; favored to win 100, they didn’t. In 2014, there was a new voice and a new message: handle the expectations with a quiet, stoic professionalism; which they did from day one. And in 2015, there was an early confidence, shattered by mounting injuries and uncertainty by the end of Spring Training; favored to win 100, again they didn’t. This year? I’m seeing a group that’s eager to play and aggressive on the field. And that eagerness has manifest as swinging at strikes early in the count, baserunning, and scoring. The Nats have led all NL teams in Spring scoring in the 1st, 3rd, 6th, and 8th innings (second in runs per game overall). At home and on the road. Playing the projected starters or minor leaguers and NRI’s. While leading (which has been most of the time) or coming from behind. Whatever the reasons, this is a team that has the look of one that wants to play, and is coming to the park ready to play. Reason 2: the “H” word. Avoiding the risk of jinxing anything, one can only hope that the new medical and training staff have already paid benefits. Despite early concerns bemoaning Zim’s restrained start to the season (which has worked absolutely perfectly), the only significant injury has been 39 year old Bronson Arroyo’s shoulder bursa sac inflammation, with a sore shoulder following elbow surgery to be expected. It looks like Harvey Sharman and his new-aged medical staff have gotten off to a great start, and one can only hope they get the credit they deserve if the DL man-days drop precipitously. The new medical ‘Moneyball’ is in play and will be judged more fairly in hindsight. Most everybody important to the team’s success is hitting, and they are scoring runs. There is certainly one major question mark in the starting eight, but to me 1-7 look solid—or better. Ben Revere is getting on base and running; he looks very good. 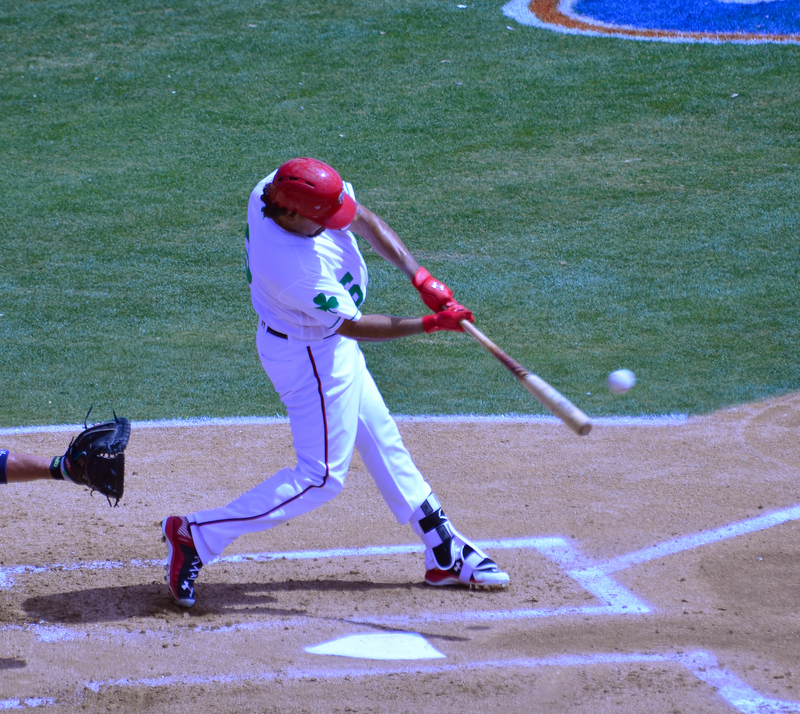 Anthony Rendon is raking, driving the ball like 2014; he looks great. Bryce Harper has been sharp when the opponent has pitched to him, and continued to take his walks when they don’t; he looks… well, honestly, bored. But that will change. Ryan Zimmerman is living up to his reputation as hitting the ball the hardest of all Nats (that sound! ), driving in runs and making other teams pay for pitching around Bryce; he looks great enough that a Gold Glove, Silver Slugger, and even an MVP could be in his future if Bryce gets the Barry Bonds treatment. 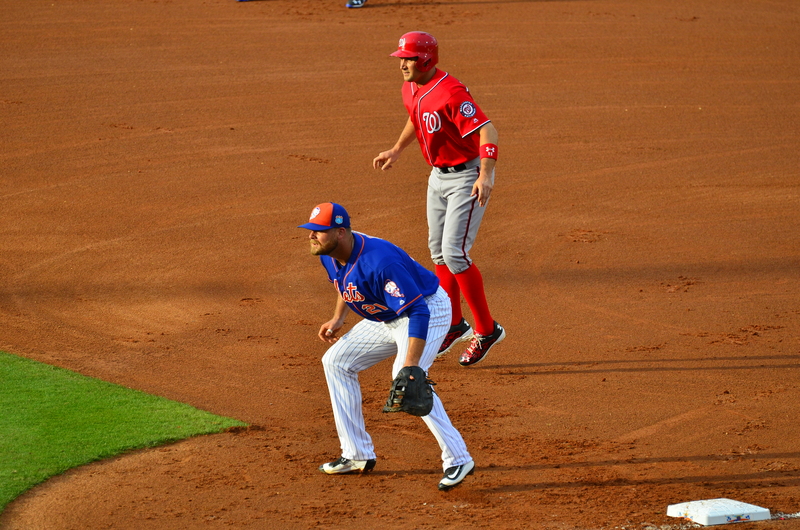 Daniel Murphy and Jayson Werth started slow and look to be rounding into playing condition, right on time; both look strong and as Dusty pointed out again on Friday, older guys often take longer to get rolling. Wilson Ramos can see, and it seems that helps him hit. Danny Espinosa looked awful at the plate for much of the Spring, but his defense has been generally excellent and his hitting has recently started to show signs of life; honestly, he looks uncertain at the plate, and that needs to change. Michael A. Taylor, if his Spring performance holds, appears to have made huge strides and will have great value as Bake’s “sixth man”; he looks awesome. The competition for the remaining bench jobs behind MAT, Clint Robinson, and Jose Lobaton culminated in solid roster choices, plus depth in the organization. Even the 25th man, Chris Heisey, has a career OPS over .900 as a pinch hitter, and looks like a guy that will do some damage in that role. At some point, Matt den Dekker and Trea Turner will factor in for this team. Each of the starters has his own motivations, and with minor hiccups, all have been effective this Spring. Max Scherzer should lead the rotation as expected, but both Stephen Strasburg and Gio Gonzalez appear to be addressing the personality quirks that frustrate fans. Stras looks more stoic and Gio seems on his way to smoothing out some of his mental valleys. 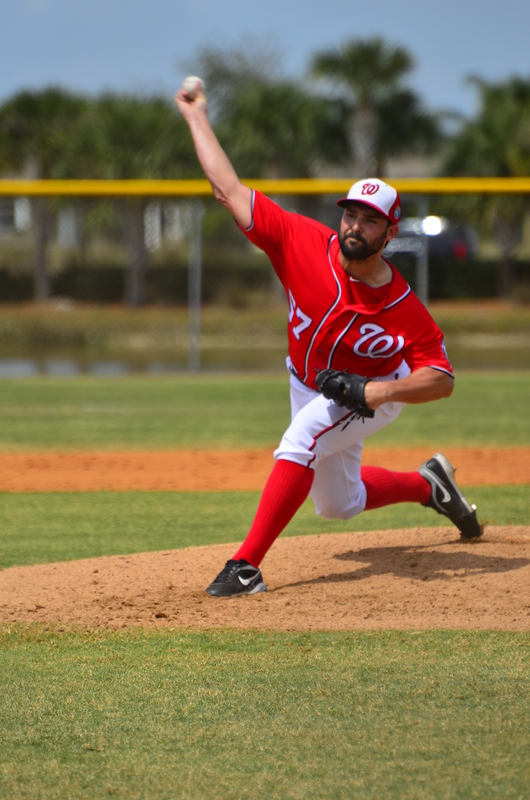 Tanner Roark appears to be a man with something to prove. Tempered by Saturday’s performance, Joe Ross continues to impress with maturity beyond his age and experience. Reason 5: payroll flexibility. Without knowing the exact number, it appears that the Opening Day payroll will be in the mid-$140 million range, down about $25 million from 2015. 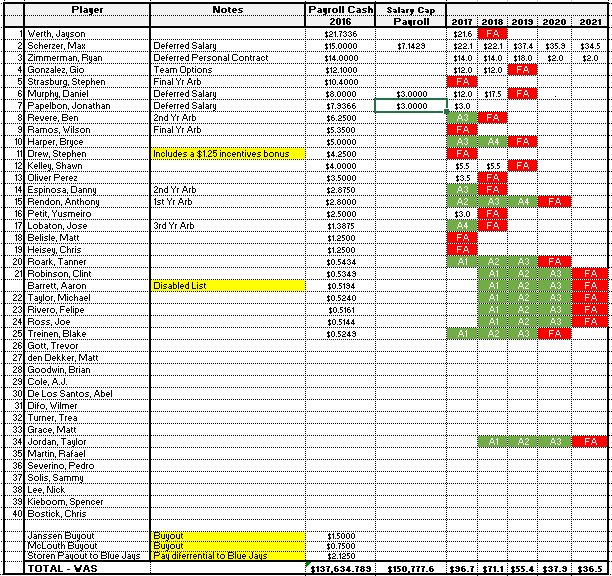 Seems that the inability to add payroll at the 2015 deadline may not repeat itself. Reason 6: the Manager’s WPA. Couldn’t get through this without some nod to analytics, highly questionable as this correlation may be. 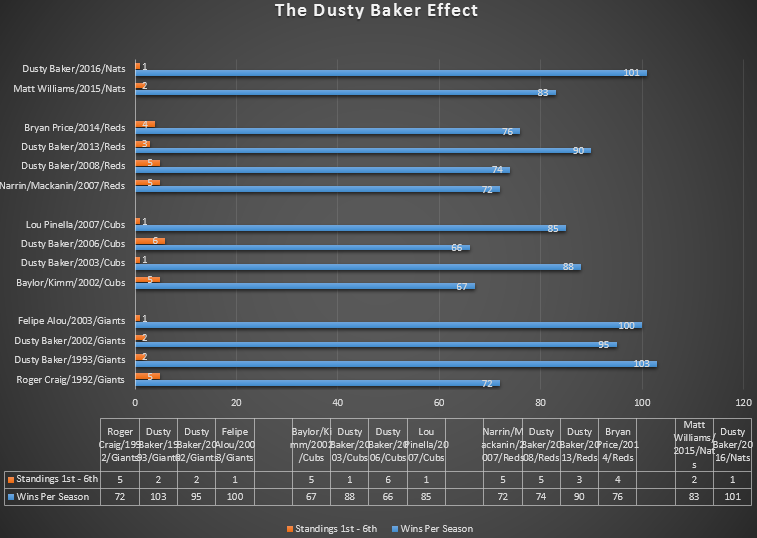 Dusty Baker‘s first year with a new team has produced an average of +18 in the win column. 83 plus 18 is 101. There is also the addition of Mike Maddux as a pitching coach and Davey Lopes as 1st base and speed coach and Chris Speier as bench and infield coach. There is value to ‘coaching’ up players. 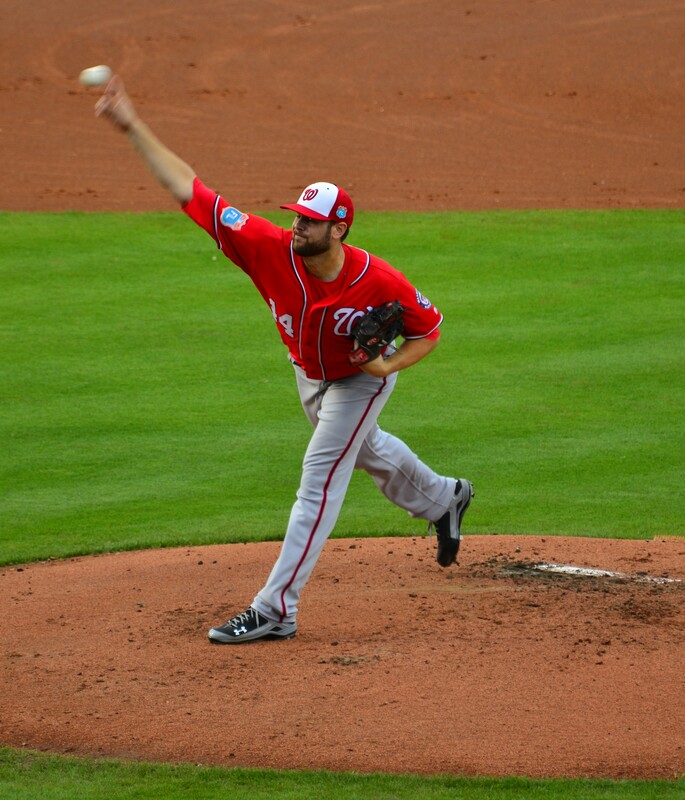 This entry was posted in Analysis, CRob, Dusty, Espinosa, Gio, Harper, Jayson, JRoss, Lineup, Lobaton, MedicalStaff, Murphy, Papelbon, Ramos, Rendon, Revere, Roark, RyanZimmerman, Sabermetrics, Scherzer, Strasburg, Taylor, Treinen. Bookmark the permalink.